The California gold rush was triggered by the discovery of gold by John Sutter on January 24, 1848. The subsequent influx of gold seekers (the “49ers”) in 1849 transformed California. An estimated 90,000 new settlers arrived in California in 1849 alone. San Francisco became a boomtown, and its population grew from 1,000 to 25,000 in just two years. Overall, the Gold Rush brought more than 300,000 new settlers to California. The rapidly growing population required an extensive infrastructure. Settlements, roads and railroads were built, and farms and agricultural towns sprang up. In the rush to stake claims and build new settlements, California Indians were driven from their lands. In the decades after the discovery of gold, over 100,000 California Indians died from starvation, disease and violence. 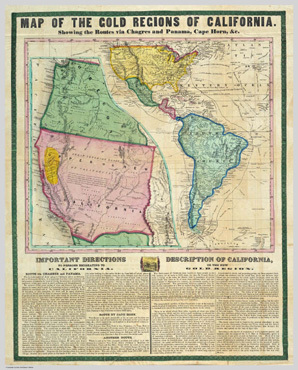 California became a state in 1850 – following a brief period as an independent republic. The mission era – which had spanned 80 years of California’s early history – had come to an end.